Taira no Tsunemasa was both a military leader and fine musician, especially known for his skill in playing the 'biwa', a four-stringed lute. Here, he is visiting the shrine on Chikubushima near Lake Biwa, northeast of Kyoto, to pray for victory in the campaign against the Minamoto. The priest of the shrine has brought out a 'biwa' and asked him to play. It was said that the goddess of the shrine, Benten was moved by his music and appeared as a white dragon promising victory. However, the Taira were defeated and Tsunemasa was killed. 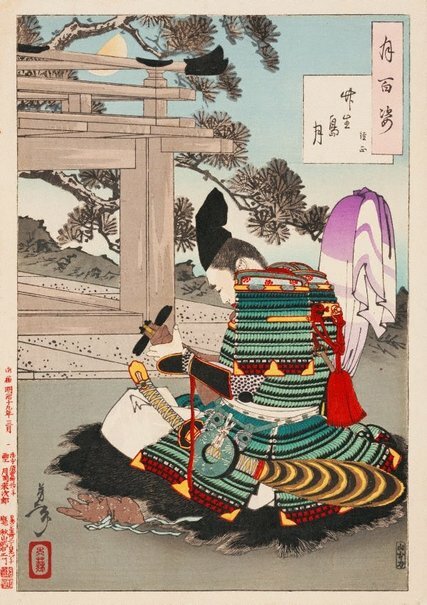 His lute was placed in a shrine constructed in his memory, and the story became the subject of the nō play 'Chikubushima'.